ZKTeco 2016 Investment & Partnership Conference (China) was successfully held in Mission Hills Dongguan from 27th to 29th March, with over 300 business partners across the world and over 1,000 participants support. Mr. John Che, the founder and the CEO of ZKTeco, has first expressed heartfelt appreciation to business partners and clients for their long term support and confidence to ZKTeco. Mr. Che also had his retrospect of operation in 2015 and prospect of future business plans and policies of strategy development. Mr. Che has stated to remain the open and cooperative attitude, and insisted investment of R&D and the innovation of technology. Mr. Che has also promised to enhance ZKTeco’s products and services quality. Representatives of ZKTeco’s global branch offices have followed to give insights on global markets and the corresponding strategies. During the Conference, advanced technology – LiveID and UAV (Unmanned Flying Vehicles) Face Verification System were showcased, which had been developed by ZK’s technicians. ZKTeco also displayed its globally leading biometric verification technologies including security, time management, identification, video surveillance, smart locks and RFID products. ZKTeco has been striving and has succeeded to apply innovative technologies to products and provide comprehensive solutions. ZKTeco has been committed to promoting the concept of “Big Security” which includes entrance security, Carpark system, car number plate identification, H.264, H.265 HD video surveillance products. ZKTeco provides solutions which are applicable to smart community, traffic system, construction site, prison, financial organization and smart office. ZKTeco aims to satisfy customers by making breakthrough of development, diversity of products, complete understanding of products’ features, widen application to different fields, and persistent perfection of product technology. ZKTeco has also signed and announced the cooperation with Tianjin Academy for Intelligent Recognition Technologies, and has invited the Zenan Sun, the Dean of Tianjin Academy for Intelligent Recognition Technologies, to be the “ZKTeco Prime Scientist”. Biometric technology has gained a huge breakthrough and has become an important element of Ethernet. In the foreseeable future, Biometrics will prevail in a wide application. On the same day, ZKTeco has initiated “Mega-managers”, a crowd-funding project, which acts as a milestone of biometric big data development. The project has gained supports from partners and has received funding over 5 million in less than an hour. ZKTeco’s staffs and partners also participated in “Dream for more with ZKTeco” cycling event which represented the close bonding between ZKTeco and partners in the development of biometrics technology. 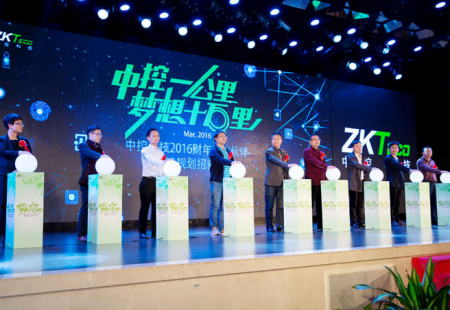 To share the achievements and delights ZKTeco has gained in the past year, a prize-awarding ceremony has been held. The Conference has been an amazing prelude to ZKTeco’s future development. Without partners’ and clients’ support and confidence, ZKTeco would not have achieved such a prosperity and stable enhancement of business. We again thank you for all your support, and promise to strive for the best for the perfection of products and services.